Posted on December 12, 2014 May 22, 2015 , in HIAB Crane. Atlas Polar is pleased to announce the newly available HIAB X-CL crane. 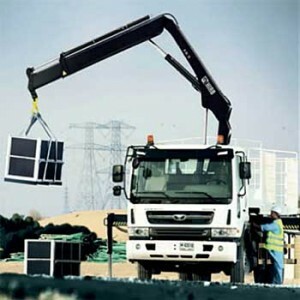 Easy to use and maintain, this powerful tool is the perfect solution to any job that requires load handling. While many business focus on using manual labour or third parties to assist them with their load handling needs, this is often inefficient, and sometimes even unsafe. Wasting valuable time while teams manually move loads or waiting for your turn to use the equipment of a third party wastes both time and money. The HIAB X-CL allows just one operator to do the work of many with a simple operational design and several attachments. You won’t need to have tons of different equipment—the HIAB X-CL can replace forklifts and conveyor belts as a safer and more efficient alternative. Whether you’re moving machines or building materials, the HIAB X-CL is an excellent investment for your business. Just as standard truck-mounted cranes, the crane is operated by side controls. However, the HIAB X-CL is different in that it provides two identical control sets on each side, so the operator can feel confident in safely moving loads around the work area. Along with easy use comes easy servicing, as the parts commonly checked during servicing are conveniently located for easy access. All HIAB cranes are made with only top-quality materials that are durable and practical so that they can meet your day-to-day needs. If something does happen to go wrong, you can have peace of mind knowing that HIAB is recognized worldwide as a leader in quality. Due to this, we have a large service network that can help you get access to high-quality spare parts when you need them. The HIAB X-CL is valuable because while it maximizes payload and allows you to move heavy loads conveniently and quickly, it is slender and light. By minimizing the weight of your crane, you can carry a heavier load on your truck—and because of the slender design the HIAB X-CL fits on almost any kind of truck. The HIAB X-CL crane is setting the standard for high-quality cranes that are safe, efficient, and durable in the long-term. To learn more about the HIAB X-CL, contact us by calling 1-888-799-4422 or emailing info@atlaspolar.com.